As one of the Original Six teams, the Chicago Blackhawks have a long and storied history in the NHL. We’ve uncovered some key moments, distinguished players and influential coaches in the franchise’s history. So let’s get to it and find out how much you know. How Well Do You Know the Blackhawks’ History? Who holds the Blackhawks’ franchise record for goals? 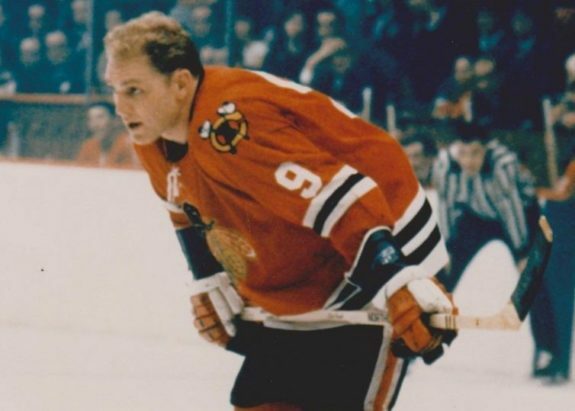 Bobby Hull scored 604 career goals. The next-closest scorer is Stan Mikita with 541. The closest active player is Patrick Kane with 285. When did the Blackhawks win their first Stanley Cup? The Blackhawks first won a Stanley Cup in 1933-34. They were the last of the Original Six to win one. How many Stanley Cups have the Blackhawks won in total? The Hawks have won six championships, raising Lord Stanley’s Cup in 1934, 1938, 1961, 2010, 2013 and 2015.
Who is the only Original Six team that has won fewer Stanley Cups than Chicago? The New York Rangers have only won four Stanley Cups, the fewest of all Original Six teams. 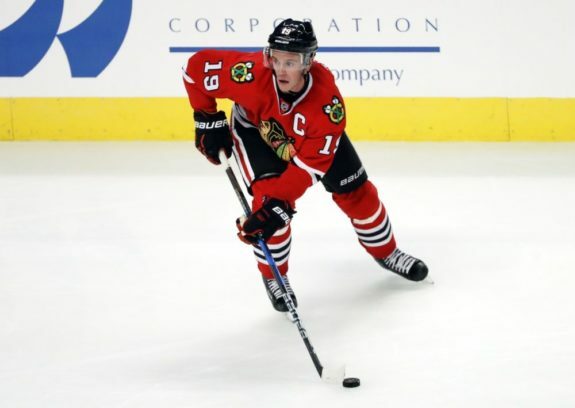 What is Jonathan Toews’ nickname? Toews is known as ‘Captain Serious’ because he rarely smiles. Who was the first Chicago Blackhawk to have his jersey number retired? Stan Mikita had his number retired Oct. 19, 1980 at Chicago Stadium. He played his entire 22-year career with the Blackhawks. Which member of the Blackhawks won the league MVP award for the 2015-2016 season? Patrick Kane took home the Hart Trophy, leading the league in scoring with 46 goals and 60 assists. He became the first American-born player to take home the hardware. Who has the most penalty minutes in Blackhawks history? Chris Chelios has piled up 1,495 penalty minutes in 10 seasons with the Blackhawks. He’s the oldest active player to win the Stanley Cup and the second-oldest in league history. 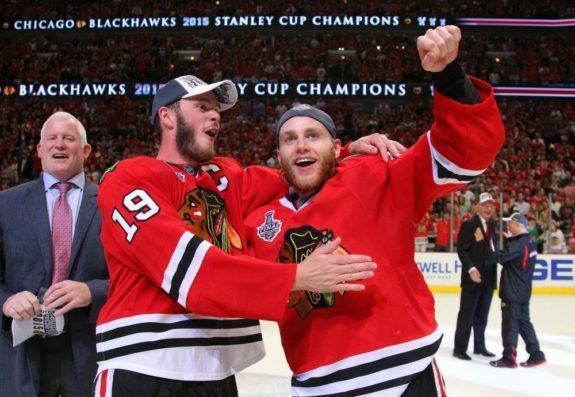 How long was the Blackhawks’ Stanley Cup drought before they won it again in 2010? The drought was the longest in the league when they broke it, spanning almost 50 years, from 1961-2010. Which member of the Blackhawks once scored a hat trick in 21 seconds? Bill Mosienko with the three pucks from his record-setting performance. On March 23, 1952, Bill Mosienko scored three goals in a 21-second span against the New York Rangers. The Blackhawks won the game, 7-6. 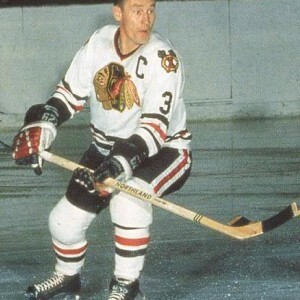 Which Blackhawk holds the record for most consecutive games played with one team? Steve Larmer set an NHL record by playing 884 consecutive games for the Blackhawks from 1980-1993. It’s a record that will likely not be broken. It’s the third longest consecutive-games streak in league history, behind Doug Jarvis (964) and Garry Unger (914). When did the tradition of Blackhawk fans cheering loudly during the national anthem start? The tradition originated during a 1985 Conference Final playoff game against the Edmonton Oilers. The team was down 2-0 in games and the crowd was trying to pump them up. “It’s great that the crowd gets involved the way they do. They become part of the performance. They show what they’re feeling and what they’re thinking. To have the fans come up to you afterwards and high-five you–it’s a tremendous experience.” –anthem singer Jim Cornelison. Who is the winningest coach in Blackhawks history? Billy Reay had 516 career wins, more than any other Blackhawks coach. Joel Quenneville has 363 wins, including a better winning percentage (.647 to Reay’s .589). What is the name of the Blackhawks mascot? Tommy Hawk was welcomed into the Blackhawks’ family for the 2001-02 season. Which former legendary goaltender was once the goalie coach for the Blackhawks? Legendary goalie Vladislav Tretiak served as the goalie coach during the 1989-90 season. Who has the most wins in goal in Blackhawks history? Hall-of-Famer Tony Esposito racked up 418 wins while playing for the team from 1969 to 1984. The next closest is Glenn Hall, with 275. Corey Crawford ranks third with 214 wins. Who has the most assists in Blackhawks history? 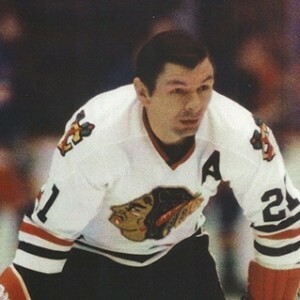 Stan Mikita dished 926 assists in 1,394 career games (the most played by any Blackhawk). With 1,467 points, he’s widely regarded as one of the best centers of the 1960s. Which former Blackhawk is one of only four American-born players to score 500 career goals? Jeremy Roenick scored 513 goals. He’s now an announcer with NBC. What was Bobby Hull’s nickname? With explosive speed and end-to-end rushes, Hull was known as ‘The Golden Jet.’ He often had two players shadowing him at all times. When did the ‘Black Hawks’ become the ‘Blackhawks’? The change happened for the 1986-87 season, after reviewing original franchise documents where their name was spelled that way. Which Chicago Blackhawk retired after the 1979-1980 season, ending a 23-year career? 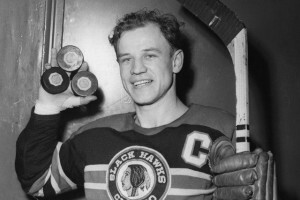 Mikita was one of the greatest players in Blackhawks history. Wearing number 21, he played his entire NHL career with the team. He scored 541 regular season goals and 1,467 points from 1958 to 1980. The Chicago Blackhawks franchise was the first to use which mode of transportation? Which new Blackhawks player played only 54 games before being suspended in the 2002-03 season? Theo Fleury, who played the bulk of his career with the Calgary Flames, was suspended indefinitely by the NHL for violating his substance abuse aftercare program. He never returned to play in the NHL. Who did the Blackhawks face in the first-ever afternoon NHL game? On March 19, 1933, the Blackhawks hosted the Detroit Red Wings. The Wings won the game, 4-3. 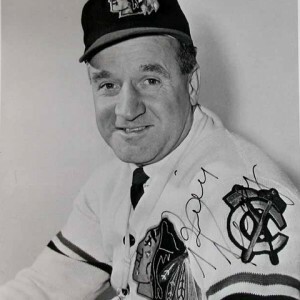 What year did Bob Pulford join the Blackhawks organization? Pulford joined in 1977 and served many different roles including coach, associate coach, general manager, and Senior Vice President of Hockey Operations. The Blackhawks were consistently among the league’s most profitable teams but failed to win a Stanley Cup in the ’70s, ’80s, and ’90s after he joined the club. On what team did Tony Esposito begin his career? Tony ‘O’ broke into the league with the Montreal Canadiens in 1968-69. After only 13 games, the Blackhawks picked him up on waivers. In Chicago, he went on to win a franchise-record 418 regular season games with a 2.93 goals-against average and 74 shutouts. What coach led the Blackhawks to a Stanley Cup Final appearance in 1992? Mike Keenan, also known as ‘Captain Hook,’ coached the Hawks for four seasons (1988 to 92). They lost to Mario Lemieux and the Pittsburgh Penguins in the 1992 Stanley Cup Final. What Blackhawk goalie was known as ‘Mr. Goalie’? 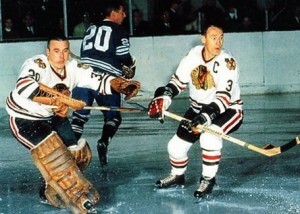 Glenn Hall played for the Black Hawks from 1957 to 1967, and his stellar goalkeeping was a major reason why Chicago won the 1961 Stanley Cup title. The legendary netminder won 275 regular season games with the Hawks, and he was elected to the Hall of Fame in 1975. 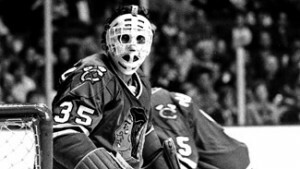 Amazingly, he played in 502 consecutive games during a time when goalies did not wear masks (he never missed a start for seven seasons, two with Detroit and five with Chicago). Which Blackhawks defenseman won the Norris trophy as the NHL’s best defenseman in 1982? In the 1981-82 season, Doug Wilson earned the Norris Trophy as the league’s best defenseman, scoring 39 goals and 95 points for Chicago. Wilson played for the Blackhawks from 1977 to 1991 and scored 225 regular season goals and 779 points. 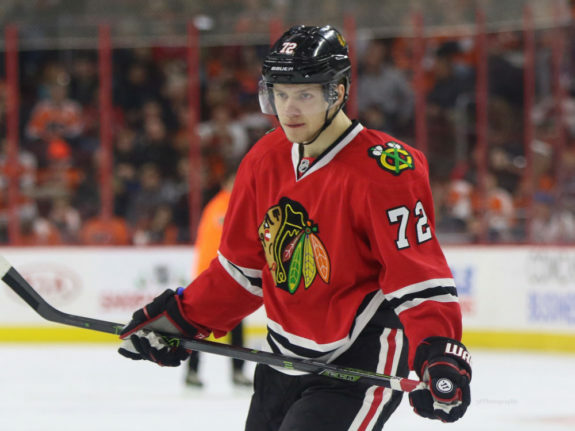 Which Blackhawks defenseman won the Norris Trophy in 2010 and 2014? 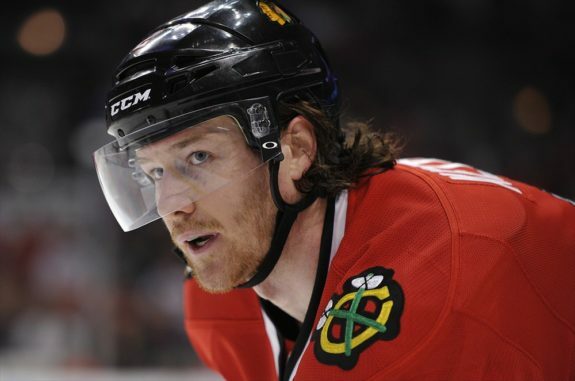 Duncan Keith was recognized as the league’s best defender in both seasons. He also won the Conn Smythe Trophy as the Stanley Cup Playoff MVP during the 2015 championship run. Chris Chelios is also a two-time Norris winner (1993 and 1996). Which NHL record did Steve Larmer establish during the 1992-93 season? Forward Steve Larmer played for the Blackhawks from 1980 to 1993. During the 1992-94 season, he established an NHL iron man-record for most consecutive games played with the same team (884). Although Larmer never scored 50 goals in a single season, he scored 40-plus goals in five different campaigns. Larmer ended up his NHL career with the New York Rangers in 1995. Why did Larmer’s record end? 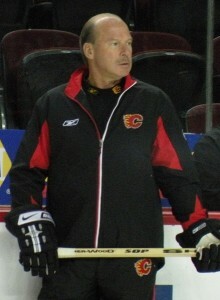 Larmer’s iron-man streak ended due to a contract dispute at the start of the 1993-94 season. He went on to play for the New York Rangers and earned a Stanley Cup with his former coach Mike Keenan. Which Blackhawks defenseman won the Norris Trophy from 1963 through 1966? 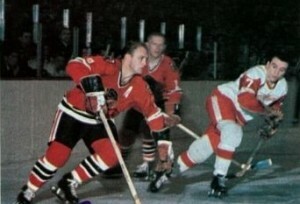 Pierre Pilote was the key player for Chicago. Pierre Pilote won the award for a remarkable three straight years. Who was the first in a long line of talented players to leave the Blackhawks in a bitter dispute over money? Bobby Hull bolted from the Blackhawks and joined the Winnipeg Jets of the WHA in 1972. He went on to score over 300 regular-season goals after his departure. Bobby’s son, a future Hall of Famer, Brett, expressed desire to play for the Hawks, but was never tendered a serious offer as a free agent. It was an example of the selfish grudges Bill Wirtz held and how the fans ultimately suffered. Which legendary Bruin ended his career as a Blackhawk? Bobby Orr played for 20 games in the 1976-77 season and six games in 1978-79, but his knees were shot by then. It was speculated that Blackhawks owner Bill Wirtz signed Orr away from Boston as revenge for getting fleeced in the Esposito deal years earlier. Whose number 18 hangs in the rafters of the United Center? 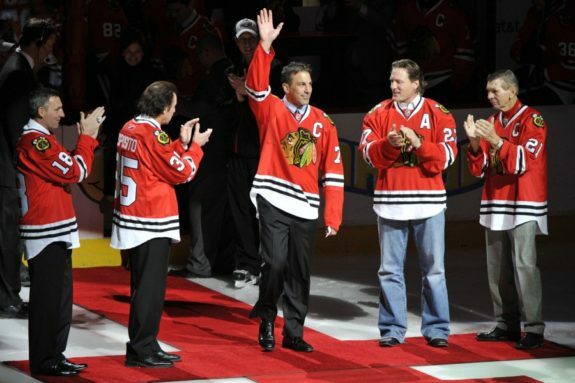 Denis Savard retired after the 1997 season and was honored with his own night the following year by having his jersey raised. He won one Stanley Cup in his career, with the Canadiens in 1993. He’s another example of a world-class player who had to find glory away from the Hawks. Who became captain of the Blackhawks, becoming the third-youngest NHL captain of all-time at the time? Jonathan Toews, drafted in 2006, joined the team for the 2007-08 season. The following year he became captain at 20 years and 79 days. Only Sidney Crosby and Vincent Lecavalier were younger. Who are the seven core players who have won three Stanley Cups together? Jonathan Toews, Patrick Kane, Duncan Keith, Brent Seabrook, Marian Hossa and Niklas Hjalmarsson and Patrick Sharp. How many games has Joel Quenneville won as head coach of this team? Coach Q has won 413 games with the Blackhawks. As a head coach, he’s won a total of 851 games. Who designed the team’s original logo? Irene Castle, the wife of the team’s first owner, and coffee tycoon Frederic McLaughlin crafted the team’s first logo. What Blackhawks forward line from the 2015-16 season included the Hart Trophy winner and the Calder Trophy winner? The line of Artemi Panarin (won the Calder Trophy), Artem Anisimov and Patrick Kane (Hart Trophy) tore up the league. What two forwards were acquired at the trade deadline in 2015 that were integral in helping the team bring home the Cup that season? Antoine Vermette (from the Arizona Coyotes) and Andrew Desjardins (from the San Jose Sharks). Vermette centered a strong third line, and Desjardins was part of a strong shutdown fourth line. How many saves did Sam LoPresti make on March 4, 1941? Chicago goaltender Sam LoPresti made an incredible 80-save performance against the Boston Bruins that night. He saw 27 shots in the first period, 31 in the second and 22 in the third. It was all for naught, as the Blackhawks lost the game, 3-2. What did goalie Emile Francis do in 1947-48 that made a lasting impact on the position? Emile Francis and his new glove. Emile Francis used a modified first baseman’s glove in a game against the Red Wings. Detroit’s coach, Jack Adams, protested to the league office, but commissioner Clarence Campbell let the use stand, thereby revolutionizing the position of goaltender. 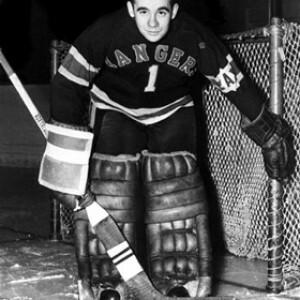 Beginning in 1948, Francis played for the Rangers for four seasons. Who was the first player to score more than 50 goals in a season? In 1966, Bobby Hull became the first NHL player to score more than 50 goals in a season, scoring 54. What was unique about the Blackhawks’ regular-season record in 1938? The Blackhawks won the Stanley Cup in 1938. They nearly missed the playoffs altogether, with a regular season record of 11-25. Can you name every Blackhawk player whose jersey has been retired? Did you know more than you thought? Are you more of a fan that you even realized? Regardless, we hope you had some fun and learned a few things along the way. This is just one installment of Original Six trivia. Be sure to check out the Rangers, Maple Leafs, Canadiens, Bruins and Red Wings versions as well.